A new pictures from the Mars Curiosity Rover has some thinking martians have good dining etiquette. An image taken on August 30 by the rover's Mastcam shows what looks like a spoon hovering over the Red planet. We've seen plenty of strangeness on that martian surface: from crab monsters, to pyramids, even a thigh bone — that make us believe in extraterrestrial life — or rocks. And NASA has already cleared up this latest find, saying, "There is no spoon. 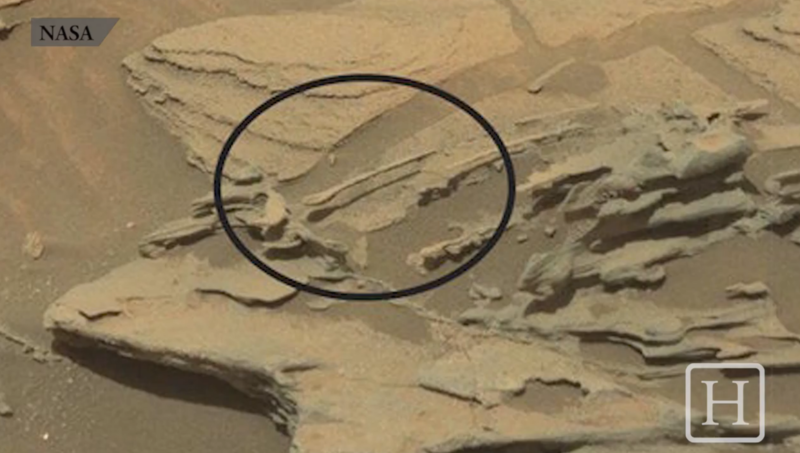 This weird Mars feature is likely a ventifact — a rock shaped by wind." This image from Curiosity's Mastcam shows inclined beds of sandstone interpreted as the deposits of small deltas fed by rivers flowing down from the Gale Crater rim and building out into a lake where Mount Sharp is now. It was taken March 13, 2014, just north of the "Kimberley" waypoint. This March 25, 2014, view from the Mastcam on NASA's Curiosity Mars rover looks southward at the Kimberley waypoint. In the foreground, multiple sandstone beds show systematic inclination to the south suggesting progressive build-out of delta sediments in that direction (toward Mount Sharp). This image shows inclined beds characteristic of delta deposits where a stream entered a lake, but at a higher elevation and farther south than other delta deposits north of Mount Sharp. This suggests multiple episodes of delta growth building southward. It is from Curiosity's Mastcam. This evenly layered rock photographed by the Mast Camera (Mastcam) on NASA's Curiosity Mars Rover on Aug. 7, 2014, shows a pattern typical of a lake-floor sedimentary deposit not far from where flowing water entered a lake. This image shows an example of a thin-laminated, evenly stratified rock type that occurs in the "Pahrump Hills" outcrop at the base of Mount Sharp on Mars. The Mastcam on NASA's Curiosity Mars rover acquired this view on Oct. 28, 2014. This type of rock can form under a lake.